A listed building nestled in the small village of Alderton, situated on the north west edge of the Cotswolds Area was one of Dajons' more challenging kitchen projects. The client wanted to convert what was an inter linking room between living and kitchen into their new kitchen space and convert the existing kitchen into a dining room with wainscot T&G wall panelling. Some of the more challenging aspects of the project were height restrictions, uneven floors, wattle and daub walls, creating new waste and water connections and preservation of the listed building. 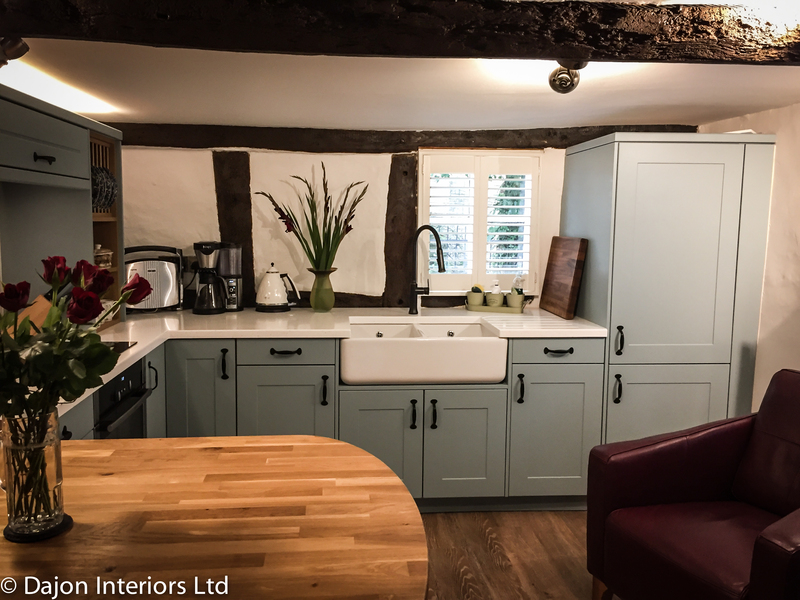 Our employed designer , Matt Cooke, relentlessly worked with the client on multiple design concepts over several weeks to create a kitchen that was in keeping with the cottage but also provide modern comforts. Using luxury materials such as Corian and selecting a bespoke painted and sized kitchen from our Dutch manufacturers, Keller, Matt was able to meet all of the clients expectations and produce a beautiful and practical design. Another great example of why Dajon is the best place to purchase a kitchen in Gloucestershire. "There really aren't enough words to describe how delighted I am with my new kitchen! The whole of the process went off without a hitch. Matt was a marvel to work with. He listened very carefully to my brief and managed to achieve everything I asked for, in spite of all the complications involving such awkwardly shaped walls. Steve, the fitter, overcame every problem he encountered within seconds and it seemed like nothing was too much trouble for him. Steve is a true perfectionist and wasn't happy until the job was correct! Pete, the electrician, was sympathetic with the age and all the quirks of the house. I asked him to provide the kinds of lighting and sockets he would like to have as if it was his own house and this is exactly what he did. Everything suits the age of the cottage perfectly. Everyone involved in this project arrived precisely when they said they would and when they left in the evenings, everything was neatly tidied and all was cleaned down beautifully. I can honestly say that the whole of the process was completely painless, nothing was overlooked and I think the results speak for themselves!